Back in 1965 when this kit came out, there was a strong standardisation to 1/72 scale. 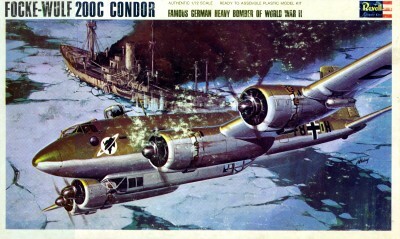 Revell capitalized on this by releasing many large four engined planes from WWII, including the B-17, the B-24, the Lancaster, and this one, the Fw200C Condor. Out of these four, the Condor is probably the least known, and as such makes it all the more interesting to have a kit of it. The Revell Condor kit's uniqueness ends with the rarity of the plane type, though. Molded in the typical bright baby blue plastic, this kit features ALL of the gimmicks and latest trends of the times. Rivets are the name of the game here, and there are lots of them. But, they are finely done, and are where they're supposed to be, so you can't blame them too much. Besides, with some careful sanding, leaving them on really adds something to the finished kit. The most noticable thing, though, is the moving flying surfaces. Every flying surface is engineered to be movable, from the rudder to the flaps. 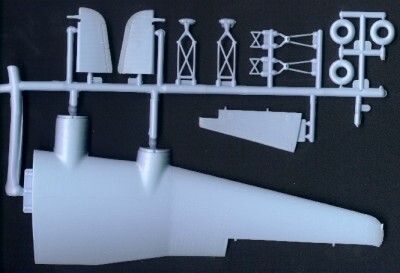 This is great because there is detail for the inside of the flaps, and you don't have to cut anything to have the elevators down or the rudder cocked to one side. The rest of the kit falls down into the basic detailing for kits of this era. The clear parts are clear, but very thick. Detailing is sort of there, with the bombs in the bomb bay being molded into the bay and the guns being little more than sticks, and very large sticks at that. In looking at them, they look like 9ft long hand held 20mm cannons, if they are to scale. I'm sure that kind of weaponry would keep the enemy fighters away! The figures are, uh, interesting, and the engines are halves molded on blanking discs.